Among limitless devotees of Sai Baba, Mhalsapati was one. 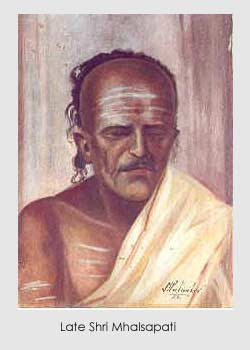 Sai Baba used to sleep in Dwarkamai and Chavadi every alternate day. When Sai Baba slept in Dwarkamai, Mhalsapati used to sit beside Him the whole night. Mhalsapati’s financial condition was very weak. But he was not greedy. Sai Baba too encouraged him to be satisfied with what he had. In year 1917, a trader named Shri Hansraj tried to give Mhalsapati ten rupees after looking at his condition. But Mhalsapati did not take it. Shri Hansraj sent the money through Shri Bapusaheb Jog, then also he did not take the money. This amount then came in the hands of Shri Hari Sitaram Dixit. He tried to give money to Mhalsapati in the presence of Sai Baba. At that time Mhalsapati was worshipping Sai Baba. He did not take even then. So Shri Hari Sitaram Dixit asked Sai Baba to give with His Own Hands. Sai Baba said, “Keep it now with you. When Mhalsapati finished his worship, Sai Baba asked Shri Hari Sitaram Dixit, “How much is the amount?” Shri Dixit replied, “Ten”. Sai Baba ordered to keep the amount near Him. Then Nanasaheb Nimonkar was ordered to distribute the amount and thus Mhalsapati did not get even a single penny out of the amount which was intended for him only.